There is a question that has echoed through the halls of eternity from time immemorial. It is a question that echoes in the hearts of every man, woman, and child. As humans, we become aware of it at certain points in our lives. The initial realization of it can cause an instant internal change, and trigger an immediate response. Or it initiates a journey that takes us deeper into ourselves and we are forced to confront what we believe and why we believe it. Over time, life happens and the things that we have held as heart knowledge convert back to being head knowledge. At this point, we hear the question again, but this time it is softer. But like a loud forceful whisper, it reverberates and cuts to the depths of our soul. This question can bring the strongest of men to their knees. Yet over the centuries it has caused men of wisdom, and women of knowledge to search through the writings of old in an attempt to give an answer. I recently watched the movie “God’s not dead 2,” and this question was the over-arching theme of the movie. It affected me in such a way that I heard this question ring out over all the voices that are trying to get my attention at this point in my life. I have been a believer in Christ for many years. Sometimes I have followed “all in,” and at other times I have strayed farther away from what it means to be a follower of Christ. I never doubted my faith in God. I have questioned it many times, but just because you question your faith does not mean you lost it. I believe that through questioning and making our faith in God our own it becomes more organic. It grows as a result of our struggles and wrestling with it. Who do you say that I am? This is the question that every human must answer whether in life or a forced realization of the answer after they die. It cuts to the heart of more than just identity it speaks about ownership. As a believer in Christ, I have testified, professed and spoken about Christ as King, Lord, and Ruler of my life. These terms are contrary to the Western world and we interpret them in a different context than those in the ancient world. Being in seminary has been an eye-opening experience because as I learn more about the bible the more I realize how little I actually know. How much you perceive to know is different from how much you do. Regardless of how many hours or years you study it you will never know everything about it, but I digress. I am learning to see God from a different perspective other than just the lens of the church. Back to answering the question. My answer to the question is a simple one. Jesus, You are the Christ the Son of the Living God. I can have no other answer than that one. I have seen and experienced too much to answer any other way. I know I am beloved by the King, and the more I learn about Him the more I fall in love with Him anew. My prayer is that everything that was once heart knowledge, but through life has become head knowledge goes back to being heart knowledge again. I pray that I burn with a passion that is viral so that everyone I come into contact with or interact with knows it. I leave you with the following prayer. “Abba! I know, I am fearfully and wonderfully made. I confess my shortcomings and my sins. I believe that you sent your only Son to die for my sins, and to stand in my place. I believe that you raised Him from the dead and that He sits at Your right hand since His work is done. I believe that He is coming again to rule and to reign in the coming future. Jesus, I believe that you are the Christ the Son of the Living God. I ask you to be Lord of my life. I thank you for Your sacrifice on the cross. Holy Spirit I ask that you guide me in wisdom and open my eyes as I read Your word. Help me to burn with a passion for You. Help me to be a light in the world that repels darkness. Help me to see the world and humanity as You see them. Help me to love without condition, to serve without expectation, and to walk in Your light. Let your grace cover my missteps, Your Light guide my steps, and Your love flows out of me like a river. What would your reaction be if you had plans that you wanted to do, but then a couple of weeks before you get things set in motion, God says No! This is exactly what happened to a plan that a friend and I were about to follow through on. My reasons for moving out to Ohio were for a change of scenery and a slower pace of life, to get a fresh start, to marry my best friend, and finally because I knew that this was where God wanted me to be. I knew back in 2007 that I was suppose to move out here, but I was not in a position to do it. A couple of weeks before I moved out here I felt God close the door on my plan to marry my best friend. There is a difference between loving someone, and being “in love” with someone. I will always love her, but I was not in love with her. We have maintained a close friendship over the years, and are closer now than we have ever been. I will always stand by her side, and I know she will do the same for me. Our friendship has evolved into the familial type bonds of a brother and sister. So, it would have been weird to go through with the marriage. I am going to be honest, but I was taken aback by it mainly because we had invested over 10 years of love, dating, and friendship into it. In the end though, God knows what He is doing. This verse is used a lot, but it fits this situation. Whenever God changes our plans, even though we do not know the outcome, He know what he is doing. P.U.S.H– You have to Pray Until Something Happens. You have to be consistent, insistent, and persistent in your prayer life. You have to have faith, and know that God answers the prayers of His children “IN HIS TIME” Just because your prayer is not answered immediately does not mean that it was not heard, nor does it mean that God does not care. God sees your heart, and He knows what your motives are before you even do it. He will honor your effort and hard work even if you do not see the rewards immediately. I am preaching to the choir with my next statement. DO stuff for others without expecting any thing in return. Bless people by the same measure that you have been blessed. So, a lot has happened during the last 4 months since my last post. I had a lot going on back in April. I was in the middle of finishing my degree, searching for a new job, making plans to move out to Akron, Ohio, and trying to get back on track where I needed to be spiritually. My writing and blog took a seat on the back burner because I was not able to give them the attention that they deserved since they are both important to me. As of right now I will be graduating in December 2014 with a degree in Liberal Studies, I am a guitar string winder for SIT Guitar String in Akron, OH, and I will be in a one bedroom apartment by the end of October. I knew I was suppose to move out to Akron, Oh a few years ago, but I was not in a good state of mind to make a big move like that. I moved out here, and God has provided me with a full time job, a roof over my head, and a easy commute. He has led me to a church where it feels at home and like family. Making the move out here was not an easy decision to make, but I know that this is where I am suppose to be. Before I found my current job I was a maintenance man for a H.U.D living community called Friendship Village for people with Special Needs and who are M.R.D.D. I am still single, but I have a deeper bond with my best friend than I have had before. I will always love her, but I could not love her the way that she needs to be loved. She is like a sister to me now… so it would have been kind of weird and she agrees. She knows that I will always have her back, and that any man she decides to marry has to realize that it is a package deal…LOL! I am currently taking my final class of my degree program. I was originally a Bible and Theology major with 12 classes left. I found out that if I switched to Liberal Studies I would only have 1 class and an assessment to take; so I took the second option and will be graduating in a few months. I do plan on getting a M. Div. soon, but I will wait a couple of years before that. I have thought about going back for a second degree to hone my writing skills, and take some formal writing classes as well. All in all I am glad that I moved to Akron. I have a peace about it, and I am going to keep trusting that God will provide what I need as He has done in the past. He is my Rock, Provider, Counselor, and Peace. Was it hard to move out hear? You better believe it, but God has a reason for me being out here. In His time He will reveal that purpose. I am going to try and post at least three times a week. I have a writer friend who has been giving me some pointer on both my blogging and writing as well. I just wanted to get your input on how the blog looks since using the new Mayer theme? I am planning on doing a Mon., Wed., and Fri., posting schedule. Mondays would be about my writing journey, and how things are going as far as getting name recognition and so on. Wednesdays would be Photo day from somewhere in DC. Fridays would be a Q and A type blog. You all can send questions and I will pick a couple to answer. Let me know what you think in the comments sention below. This is a rant against facebook. Granted after all is said and done at least the page is up and running. This is a great post. I am ordering this book for myself soon. I referenced Anne Lamott’s Bird by Bird: Some Instructions in Writing and Life in last week’s “Five Posts to Write Right Now,” and we’ve used her in Blogging 101 assignments as well. Personally, I turn to this book again and again — when I’m staring down a blank screen and a deadline or feeling just not good enough, flipping to any page usually restores my perspective and helps unclog my thorniest word-jam. 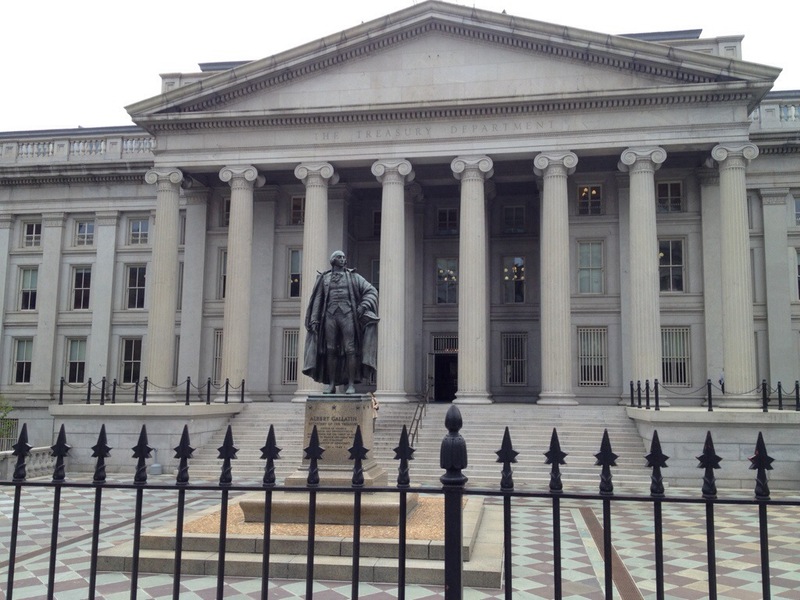 This is a picture of the Treasury building in Washington DC. I know this is a day late, but better late than never. In Christian circles the Easter weekend beginning with Good friday is a time of Prayer, Praise, Salvation and Thanksgiving. It is a time to reflect on the human condition as well as ourselves personally. We look to the one who is our Eternal Hope, and Salvation. It is only through His sacrifice that we have been redeemed, and may come boldly before the throne of grace with no need for a human mediator. The past couple of years have been tough for myself and my family. It was only through our faith in God, the support of our church family and the strength that God gives us when we have used the last of ours. I have read some articles that debunk the verse “God will no give you more than you are able to bear.” Some cite the death of a child, disease, death of a family member,loss of job or some horrible catastrophic incident that happens. All of those would bring anybody to their knees, and make you want to scream, yell, shake your fist, or even go off on God with a long string of expletives. When there is nothing else that we can hold onto to and when you have reached your last thread of sanity that is where Hope shines its brightest helping and guiding you back from the edge of destruction. I believe God does not give us more than we are able to bear because it is HE who created us in the womb. It is HE who knows how much we can bear, and we as human beings can only view oue strengths and weaknesses through finite eyes and mental faculties. Loss, death, and tragic things are all a part of life. My intention is to in no way diminsh the pain and anguish that people go through. There is a God who took human form in the person of Christ Jesus. He lived on this earth for 33 years and suffered everything that humanity goes through so that he could be the perfect sacrfice. The only person who could take your place. He is our Hope, and our futre. He is the reason that we celebrate on Sunday morning. Were it not for His resurrection what hope would humanity have in the end. To the people who say God is dead or God is not real. I would rather live my life like there is a God, and die finding out there isn’t; than to live my life like there is no God and to die only to find out HE is real. There is no condemnation here because I know I have made my fair share of mistakes. This is my prayer and blessing to you all whether or not you believe in God or another god. Name is Josh, and I am from Dale City, VA. I have decided to come “out” in terms of being online. I believe as human being we learn from the experiences that we have, and that the knowledged gained should be shared. Also you are never to old to learn and never too young to start learning. We feed off of experiences, and I believe that I might be able to help people out there I do not know. I may have gone through something that you are currently going through, and I may write something that with help you through it. I am also trying to become an author as well. I mainly write paranormal/supernatural/action/romance type stuff, but I am not afraid to branch out and try something new, I already have my first book in the series I am writing planned out, and have started writing character profiles and developing the plot lines. All in all it should be an exciting series though. Thanks for checking out my blog. This is the first entry of many, but this blog will be mixed with various stuff. I may throw in a personal blog sometime, or somthing about my writing another. It depends on my mood. The one thing you can always count on though is that this will be a positive blog with a positive message threaded throughout. Thoughts toward faith. Prayers toward wholeness. Aiming to love the way I have been loved. Simply.